Golo line breeders used a selection of Respect (Juanita X Cannalope) which they called Respect #15. 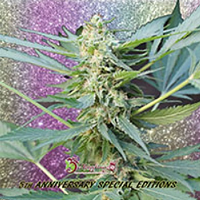 SugarJuani Feminized Marijuana Seeds by Philosopher Seeds: Golo line breeders used a selection of Respect (Juanita X Cannalope) which they called Respect #15. It was selected due to its prevailing Juanita La Lagrimosa aroma. It was then backcrossed again with Juanita in order to consolidate its characteristic flavour; SuperJuani was born from this backcrossing. 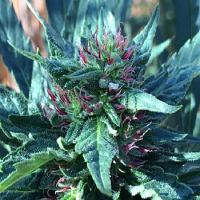 SuperJuani is not recommended for beginners in cannabis growing; it presents a Sativa structure with relatively long internodal distances, producing different phenotypes quite uniform in height. After the photoperiod change, it will enter a pretty long pre-floral period, in which it will stretch out, so it is advisable to have a grow room with sufficient height. This characteristic makes it an interesting option for growing under the guidelines of the Scrog technique, to which it is perfectly suited. 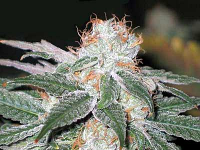 The flowering period is around 65 to 70 days in most phenotypes, with an above-average yield. Grown outdoors, SuperJuani is capable of reaching more than just a considerable height, so if you do not want it to draw the attention you will have to control it through pruning, or postpone planting it until the first fortnight of July. It is also true that this vigorous growth leads to a spectacular yield. With this crossing, the Haze-incensed smell and taste of the Juanita La lagrimosa elite clone has gained in fruity tones, which blends very well with the aniseed and earthy hints of Cannalope, although it is worth saying that - organoleptic ally - Juanita’s aromas prevail. SuperJuani produces a light effect that leaves you into a pleasant state of wellbeing, perfect for daily users. 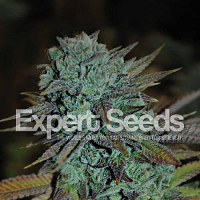 Due to the presence of Juanita genetics from both parents, it is very likely that a large proportion of SuperJuani seeds may contain CBD, information that we will be able to confirm as our research continues.